This math center game reinforces subtraction skills. 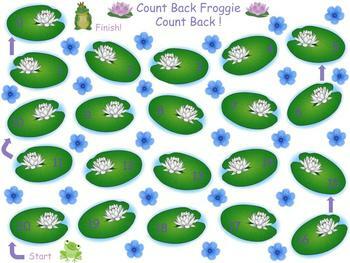 I purchased little plastic frogs at a local discount store for the children to use as counters and game piece to move around the board. With the recorder sheet, if you want a record of what the children are doing in the center, simply print. I laminated the recorder sheet and had the children use Crayola dry erase crayons. Included in this package is the game, recorder sheet, and task card. In this packet, you will receive the game, recorder sheet and task card.